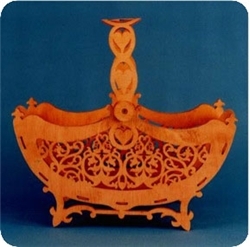 Here are some nice Basket Scroll Saw Patterns. A unique curved bottom and handle add style and charm to this simple, yet elegant basket. The removable top/basket is deep enough for a variety of uses from plants to rolls and everything in between! The full-size set of 2 patterns includes a square of 11” and a rectangle 9” wide x 16” long. Large, plain collapsible basket patterns-ones that can be cut on a band saw or a scroll saw.This 4 pattern set includes a circle, square, oval,and rectangle and ranges in size from 9”H x 8 1/2”W - 15”W. 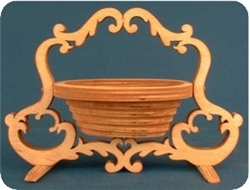 This elegant scrollsaw basket will not only be useful, but will be quite the conversation piece. 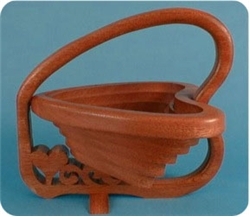 Cut from 1 piece of wood, you’ll be amazed at how this basket can be flat 1 minute and folded out the next! This handy basket will offer many uses - fruit, hand towels, mail, stationary, etc. Amaze your family and friends with this elegant curved bottom Victorian basket. 15” long. Add a splash of color to your patio or deck with this easy-to-make country heart planter. 11” wide. Here’s an adorable hinged-lid basket that you’ll find many uses for in the kitchen, bathroom, bedroom, guest room, etc. 9 1/2” long. 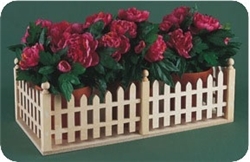 Use our mini-wheelbarrow to beautifully display blooming potted plants on your patio or deck. Indoors, silk flowers or trailing ivy can be used. This unique hanging planter will be a beautiful addition indoors or out! 15”H. 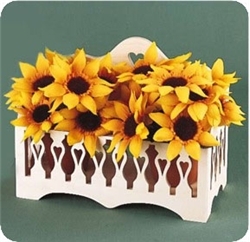 Display your favorite flowers in this adorable planter. Leave unfinished for rustic, country look or paint to match any decor. Will hold three 6” pots.